I had two desserts in mind for Mia’s wedding shower, cupcakes and sand dollar cookies. Cupcakes are a piece of cake, I have made those enough times that I wasn’t worried. 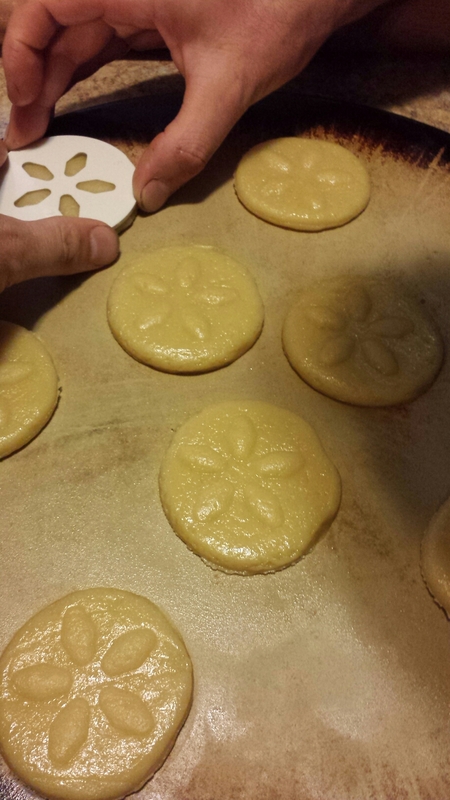 I attempted these adorable sand dollar cookies that I found on Pinterest, but they were just awful! Even my kids didn’t like them. Admittedly, I had the wrong type of flour, but they will be an attempt for another day! Second choice of cookies was sugar cookies. This was a pin that I’ve had for a while, but haven’t had the ambition to make. I strongly recommend visiting the original post for full instructions, as I skipped a few steps, mostly out of laziness and lack of supplies. You start by whisking your flour and baking powder together. In a stand mixer, mix your sugar and butter together using a dough hook. When it’s well combined, add your egg and extract, and mix again. Once it is all mixed together, add your flour mixture a little at a time. Towards the end you will most likely need your hands to finish up. Once it’s all mixed together, put it in a plastic bag and refrigerate for about 20 minutes. After the dough has firmed up, roll it out on a bake-able surface. (The original pin talks about parchment paper, but my kitchen doesn’t run to parchment paper) I used my trusty Pampered Chef pizza stone. I also got to use my new rolling pin! Don’t go too thin when rolling it out, I went about a half inch in thickness. 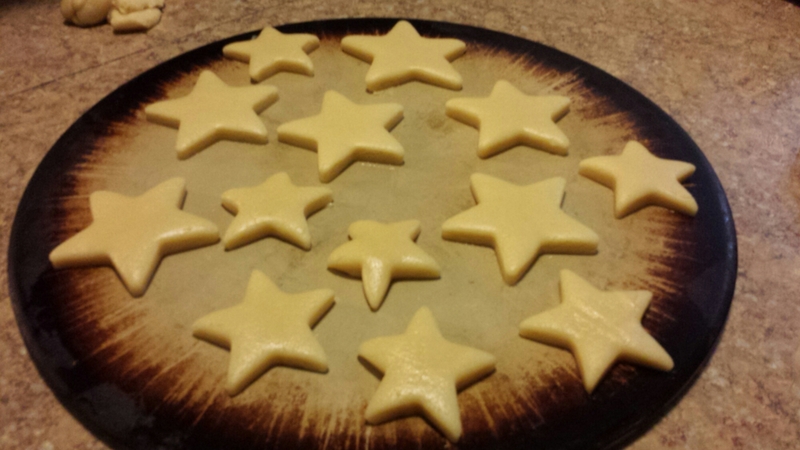 I found these adorable star cookie cutters to stay with the beach theme. I found that if I wiggled the cookie cutter around a lot before lifting it, my cookies had more of a starfish look, uneven ‘legs’ and all. You don’t want to move the cookies too much, as the dough will tear! Tony knew I was a little bummed I didn’t have my sand dollar cookies that I originally wanted. 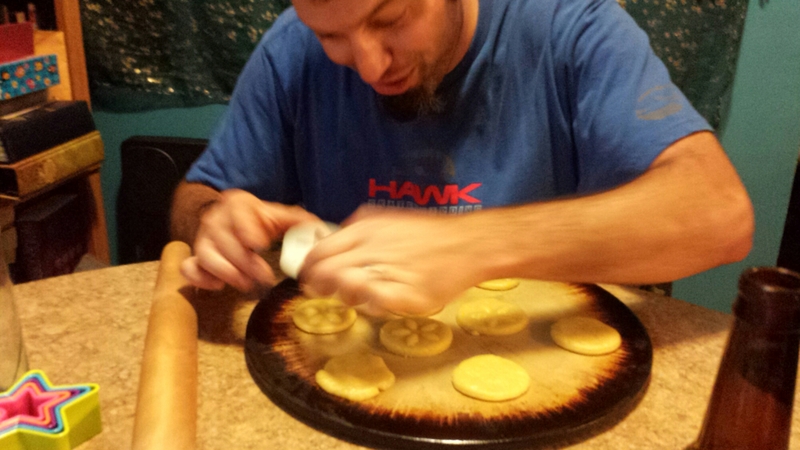 Loving husband that he is, he found a way to make sand dollar cookies out of sugar cookies! After you have your cookies ready to go, refrigerate again for 5-10 minutes to help firm up the dough. After they’ve cooled down place them in your 350° oven. The timing depends on how thick the cookies are. I took the original blogger’s advice and set my timer for 6 minutes. The pizza stone did mean it took a little longer, but I just started watching the cookies like a hawk. Oven light on, blanks stare……. it was a lot of fun! I was watching for the moist look of the dough to vanish and for a hint of golden color to show up. 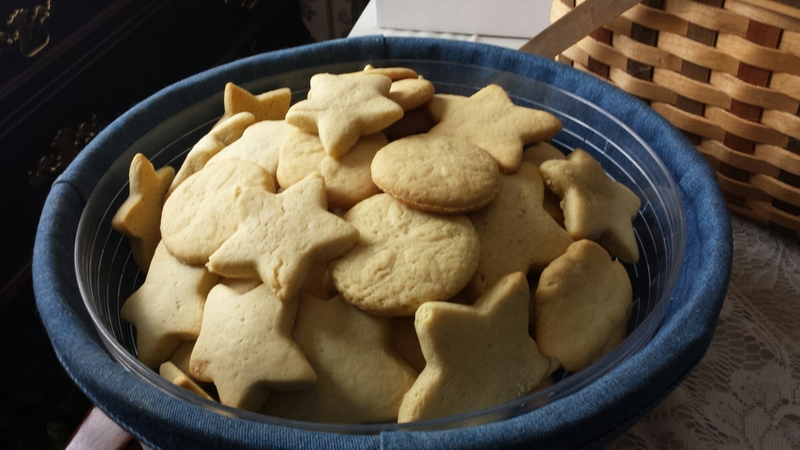 End result, delicious cookies, beautifully displayed in my Longaberger basket! This was a spinoff of an idea I found on Pinterest, of course! The original photo, which unfortunately didn’t link to anything, showed bigger shells that people could more easily leave a message on. I was hoping to find bigger ones, but we had a small planning window. The idea of this is to give the bride and groom, or in this case, the engaged couple, something small and decorative to remember the event and who came. My husband and I still have our wedding guest book, but it’s been in the top of the closet since we moved into this house. 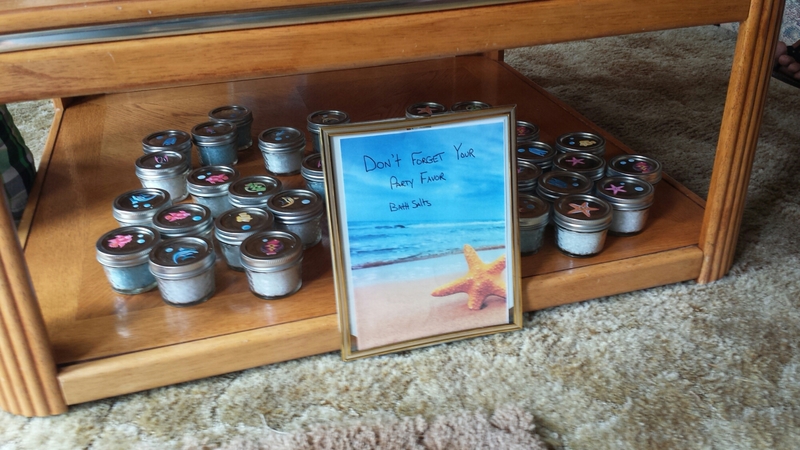 Tony’s cousin actually had stones for guests to sign. Sticking to the seaside theme, I wanted to use shells. 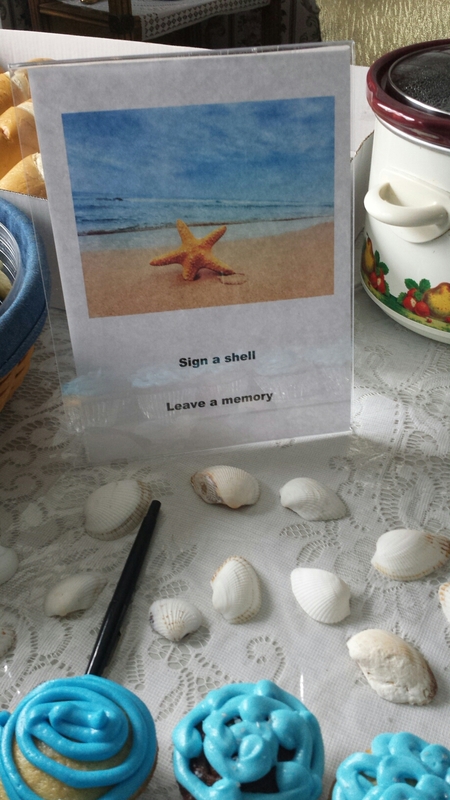 I was able to find a bag of shells at Pat Catans, a craft store we have here, and they were big enough for people to sign there name, and maybe leave a short message. We made a small sign, with the same background as the invite, to let guests know what is going on, otherwise the shells can easily be mistaken for part of the decor. 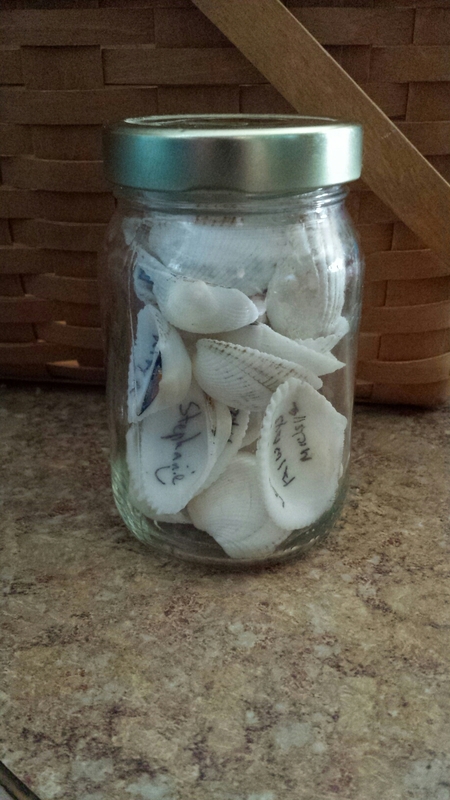 After the party, and ensuring everyone had signed a shell, I brought them home to find a jar to place them in. If you’re using bigger shells, or stones, you can use a bowl or vase to keep them in too. This makes a nice, decorative reminder of the great time you had! Just a quick little blurb, hope you all enjoy! This was a fun little pin that I’ve had on my Gifts board for a while now. 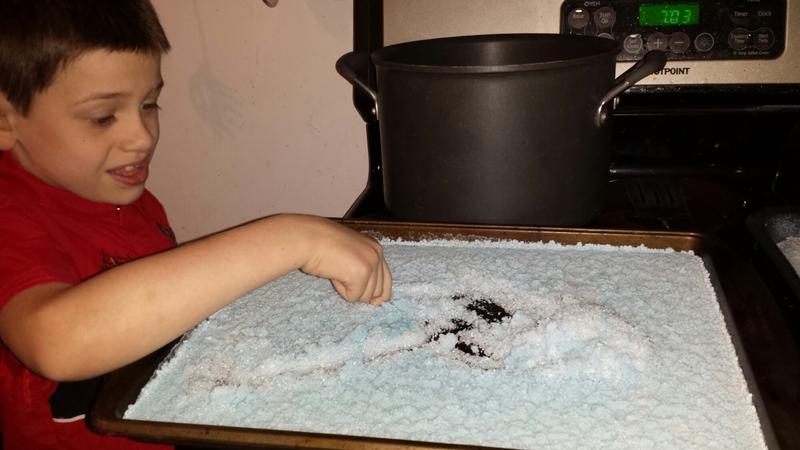 I don’t usually have Epsom salt in the house, but I figured I would get to this one around Christmas. Along comes Mia’s bridal shower and I get to play sooner! I used Equate Spring Fresh bodywash. I used olive oil (because I had it). Optional 2-3 drops of essential oils. I didn’t use any because I couldn’t figure out what would compliment ocean scent. I used blue, again to stick with the ocean theme. Chiara loved helping me stir it all together. 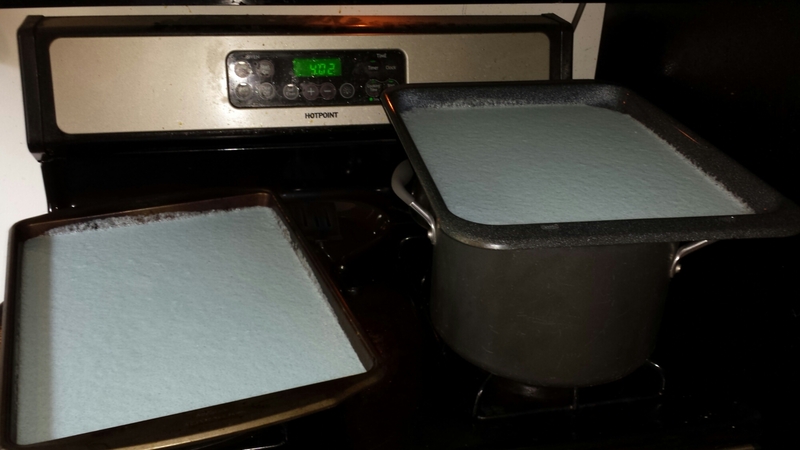 Then you spread it out on a cookie sheet to dry. Directions said a lined sheet, but I love to skip steps! First batch I had serious concerns about it drying, so I sat it in the sun. What I failed to realize is that it does look a little gooey, even when it’s dry. It should take about 24 hours to dry just sitting inside (that’s how long batch two took). Arthur had fun helping me break up the first batch. 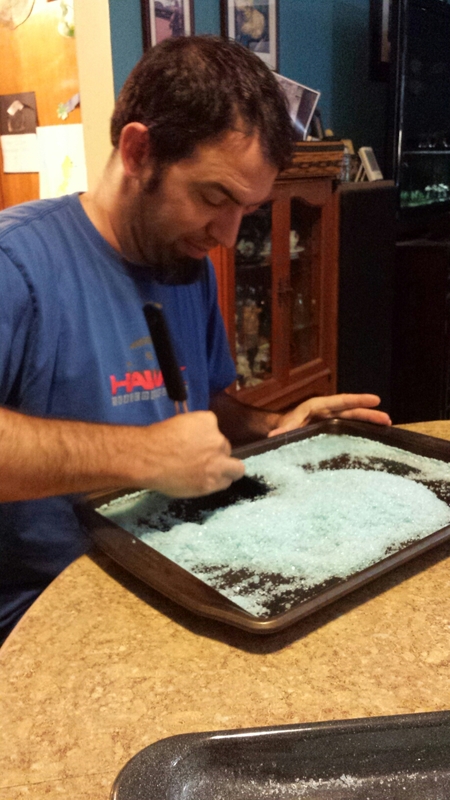 All you do is dig in with your hands, break up any clumps, then place in air tight containers. Tony decided it was more efficient to use a spatula, then he proceeded to streamline my jarring process. I love when he gets involved in my Pinterest projects. 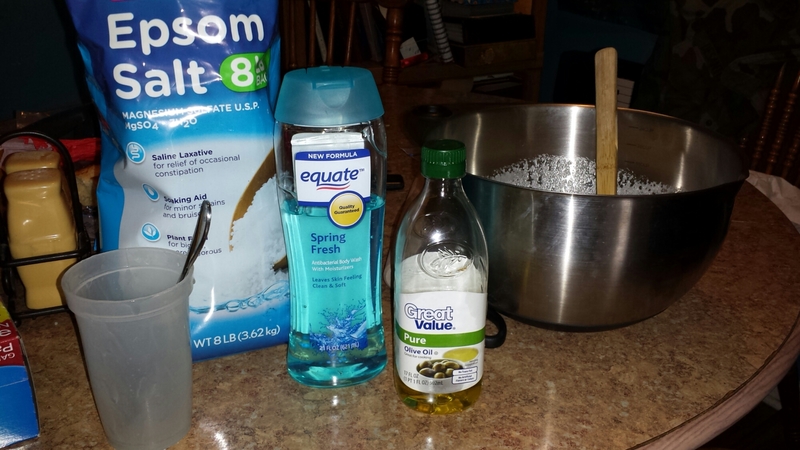 It’s really funny when he takes over, like when we made vanilla extract last Christmas. All in all this was a super simple pin and it has huge potential for gift giving. Even if you’re just making some for your own use! For use of this you just pour a 1/4 cup under hot running water and step two is to enjoy! Be sure to check out the original pin here. Hopefully you can figure out that she’s the one in the dress! The handsome gentleman next to her is her fiancé Kevin. 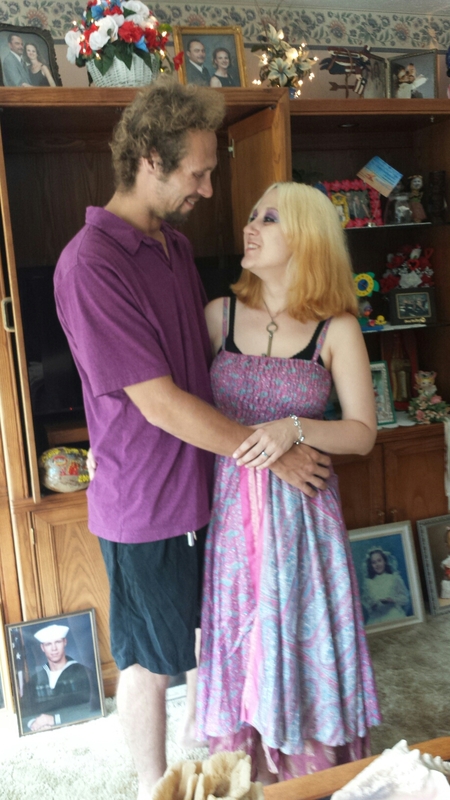 I was so excited when Mia told me that they were getting married! They’ve been together for several years now and are wonderful together. Early in the ‘planning’ process, I asked Mia if I could play with Pinterest on her behalf. So there was wedding input, believe me! They’re having an ultra simple beach wedding in a little over two weeks. She brought up a bridal shower, which was going to be even more fun to plan, as there would be more than 10 people there! Kevin’s cousin and I put our heads together with Mia’s mother to plan a seaside shower for the happy couple! Mia’s mom got very excited and into it, so thankfully we were able to use there house to hold the shower. 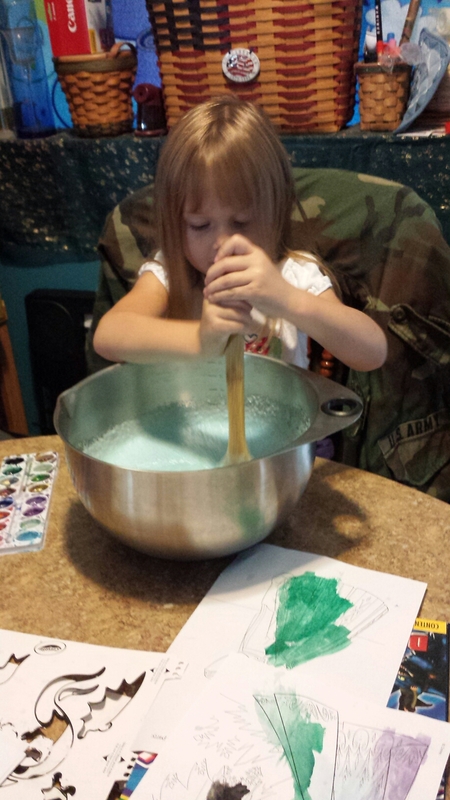 This will lead to a short series of posts, as I used a lot of Pinterest ideas for the party. The general theme and decor however, can be covered in this first introductory post. The food was pretty simple, and as it was a lot of family invited, varied greatly with guest contributions! Delicious though, oh so delicious! 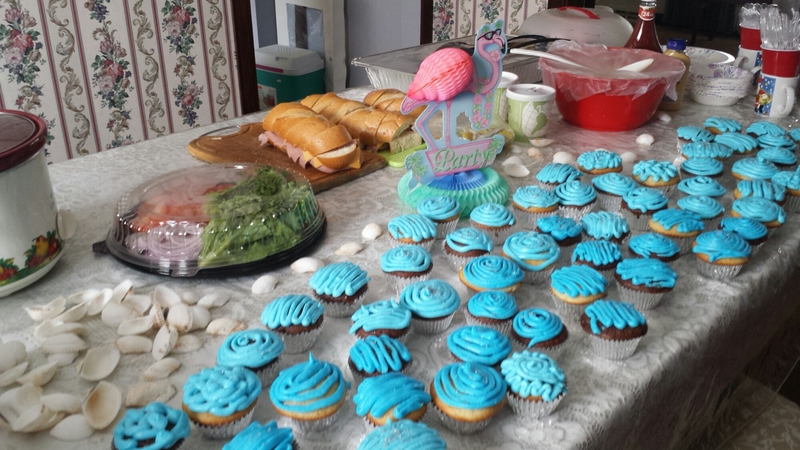 The cupcakes were Betty Crocker, the icing my mother’s, by way of Wilton, and they were fun to decorate! I used a Ziploc bag of icing, with the corner cut open, and used whatever pattern popped into my head. It brought to mind the ocean, as it does whatever it wants too! 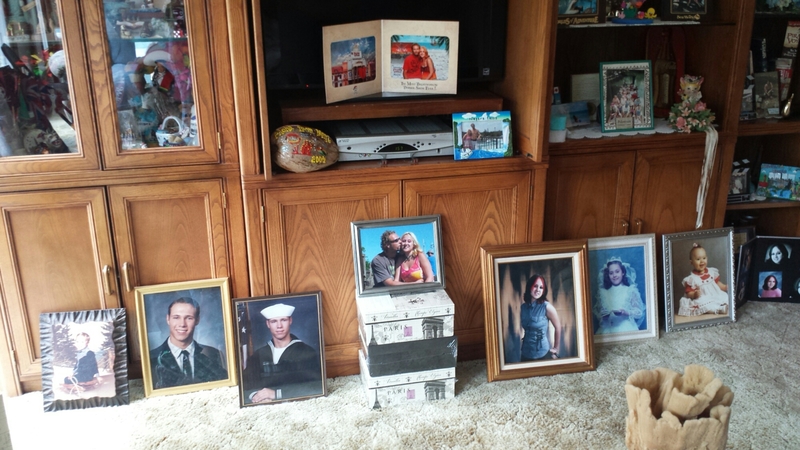 For part of the decor, I used pictures of the couple, starting with younger pictures on the outside and working toward a picture of them in the middle. This is always a nice way to let family see them both, as the guests may not always know a lot about the significant other. At least the progression from child to now can be seen! This was a brilliant idea from Mia’s mother! 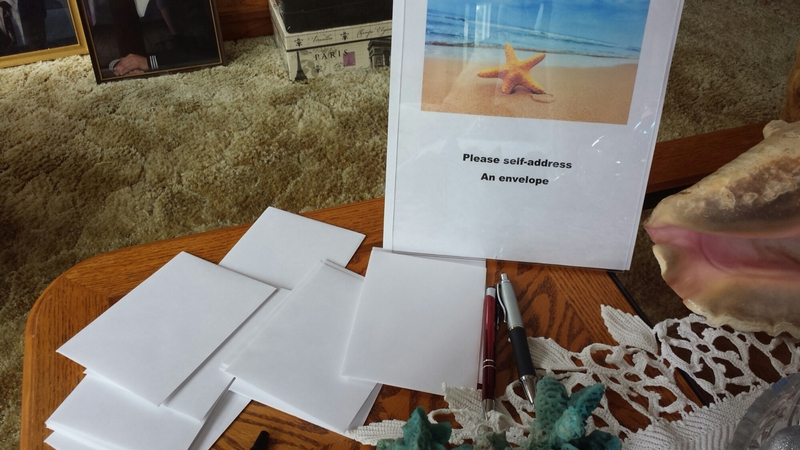 Have envelopes available as guests come in, so they can fill out their own address. This makes it easier for the couple to send out those oh-so-important thank-yous! I was lucky that Mia’s parents had a ton of inexpensive frames (formerly from his card stand) around the house so we could use them to inform the guests what’s going on. I will be going into more details about the things we had going on, like the favors referencing the idea, today was really about introducing the theme and showing the overall look. I’ll end this post, showing off the invites I made up. I found this picture in several locations online, I was unable to locate the original location, but it can be found through Bing or Google. 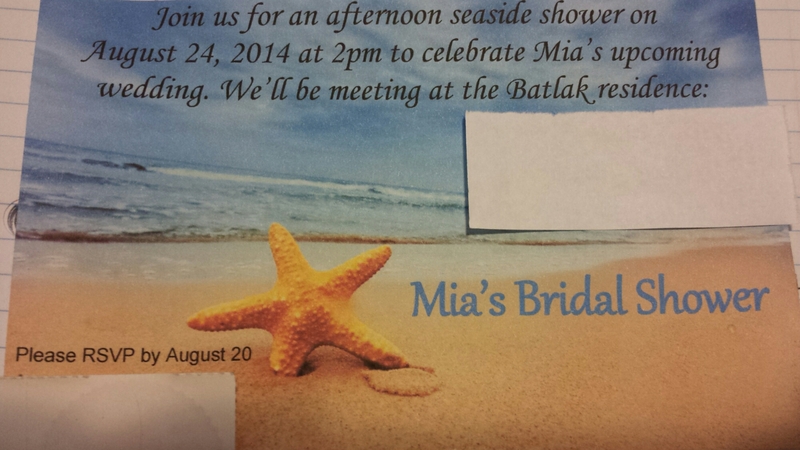 Just like in the kids’ birthday invites, I opened the picture and had the writing overlap the picture. This always takes me some time to get it right, but I’m always so happy when it turns out. I’ll be back soon with more input on the favors and games we had.